One of the most popular pastimes in North Georgia is hiking. And it’s no wonder—the Blue Ridge Mountains are stunning and picturesque. We believe one of the best ways to become familiar with the natural beauty of this region is to trek through it, and we’d love for you to explore one of our favorite places, the Hemlock Falls Trail. Keep reading to discover what makes this trail and the falls so special and begin planning your visit today! Don’t forget to make time to explore all of the other exciting things North Georgia has to offer! Download our complimentary North Georgia Vacation Guide for a complete listing of the top things to do and see in the area. In addition to several great hikes like the Hemlock Falls Trail, our guide lists recommendations for the best shopping, top restaurants, and more. Where Is the Hemlock Falls Trail? The Hemlock Falls Trail is tucked away near Moccasin Creek State Park. It is an easygoing hike at just two miles round-trip. To get to the trail, follow the gravel road by Moccasin Creek and look out for signs for Hemlock Falls. You’ll be directed to a clearing where you can park. What Will I See on the Hemlock Falls Trail? The main attraction of this trail is in the name: Hemlock Falls, one of the best waterfalls in North Georgia! You’ll find this stunning sight at the end of the trail—a reward for your efforts of trekking through the forest. The hike presents you with scenic beauty the whole way, so the waterfall is really just the “cherry on top.” As you follow the trail that meanders along Moccasin Creek, you can hear the sounds of the water rushing. Just before you reach the waterfall, you will cross a small wooden bridge. Then, you’ll need to climb a stone staircase. You’ll know that you are getting close to the waterfall because you will hear its roar intensify. The water in Hemlock Falls tumbles from a cliff into a tranquil pool below. If you’re here in the spring or summer, you may see blooming rhododendrons surrounding the trail. In the fall, autumn colors will surround you. No matter what time of year you visit, this trail will become one of your new favorite North Georgia hikes! Once you arrive at the waterfall, take a moment to relax and enjoy the view from the sandy beach. When you are ready to head back to Glen-Ella Springs Inn, follow the same trail back to your car. 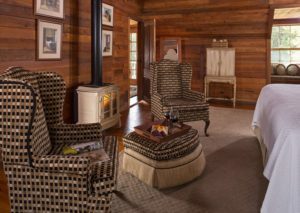 Unplug and Recharge at Glen-Ella Springs Inn! After a lovely adventure on Hemlock Falls Trail, return to Glen-Ella Springs Inn, where you can enjoy a pastoral paradise nestled in the North Georgia mountains. Our elegant, modern inn and verdant gardens ensure a truly rejuvenating experience. You’ll love our comfortable beds, meticulous attention to detail, historic architectural details, and spectacular views! Why not treat yourself to a stay in one of our Penthouse Suites this season? In your private suite, shabby-chic decor strikes the perfect balance between rustic and modern. After a fun day of exploring in the mountains, you’ll even be able to soak in a luxurious corner Jacuzzi tub. Unwind with a glass of wine by your private fireplace or as you watch the sun go down over the mountains from your intimate balcony. No matter how you choose to relax at Glen-Ella Springs Inn, you’ll leave feeling pampered! Ready to see the Hemlock Falls Trail for yourself? Check our availability and book your getaway to the North Georgia Mountains today! We can’t wait to welcome you and yours.